Will insurance drones fly around and monitor our physical activity, and will Big Brother health plans tell when we’re depressed by monitoring our iPhone activity? Will employers use office space as rental housing for employees? Well, maybe. How about worker teams that are personality-typed and -matched and people working long—very long—into old age. Even more likely: Both white- and blue-collar jobs replaced by robots, and benefits tailored to address each employee’s unique needs. 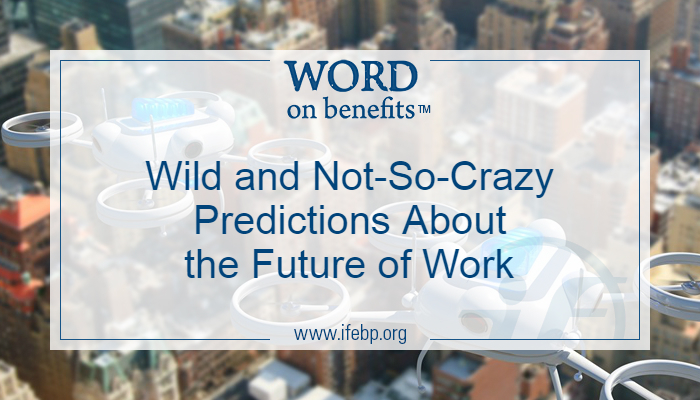 These are a few of the predictions about the future of work, benefits and HR that Chris Chan, an innovation imagineer at Mercer in San Francisco, California, made at the 35th Annual ISCEBS Employee Benefits Symposium in Baltimore, Maryland in September. When you think about office space sitting empty at night while people commute to work two to four hours daily in some of the economic megaregions in the United States, Chan’s wild and crazy idea that employers will rent out office space as housing begins to make sense. 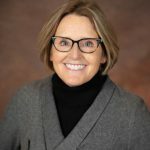 While those employees are at work, Chan predicts that sensors in the connected office will monitor whether the supply of paper and staples needs to be replenished or what documents to display at a conference table based on who’s attending the meeting. “It’s far out there, Minority Report stuff, but it’s going to happen,” Chan said. Technology also will help employers to determine employees’ net worth to the company. They’ll use e-mail tracking—looking at measures such as how many e-mails individuals send, how many of those e-mails go to senior leadership and how many replies they receive as evidence of whether those individuals are able to rally the troops to get a project done. Automation of work will continue, Chan said. “We’ve seen it in the blue-collar segment where manufacturing jobs have been replaced by robots,” he said. Robots are being used in other places too. They deliver orders at fast-food restaurants in Japan. Royal Caribbean has robotic bartenders on a cruise ship. They’re being explored for use as caretakers and are even getting into creative and artistic endeavors. With all this technology, will Chan’s final wild and crazy prediction—work will cease to exist—come true? Does that mean a lifetime spent relaxing in a hammock? Possibly. What will be important, Chan said, referencing Corona beer’s latest advertising campaign, is to “find your beach,” whether that’s a shop on Etsy, a YouTube channel with millions of subscribers or some other venture.